Whenever I get into a conversation about which wings are the best, one name always seems to find its way into the debate… Pic-A-Lilli’s. If you are from South Jersey, or know the area, you will find a time when someone will recommend this Shamong bar for some good times and great wings. In fact, with “King of the Wings” printed on the menu, it must be true, right?? Only one way to find out, so I head into this family owned business to see for myself. I take my seat in the “sit down” section of the bar and order myself a drink. Looking over the menu I see a variety of styles. Ears, tails, onion rings, and shrimp all get this buffalo makeover, but this critic only has eyes on one prize… the wings. That’s what they’re known for, so that’s why I’m here. I ordered the 6 wing basket in Spicy sauce with a side of Hot and Smoker to try. Don’t let the quantity fool you as this is really a 12 wing meal. Pic-A-Lilli’s serves each wing together (wing and drum attached) like some other places, but the one thing that stood out from the rest was the fact that they removed the tip from each one before serving. Now I know some of you love this portion to chew on afterwards, but this guy right here can live without it. Thus, making this feature an awesome perk (Kinda like fluffing a pillow… it doesn’t NEED to be done, but it sure feels good when it is). I was also supplied a bowl filled with napkins for all my cleanup needs, which always makes this wing eater smile. The wings showed up nice and crispy with a smell that permeated the air around the table. 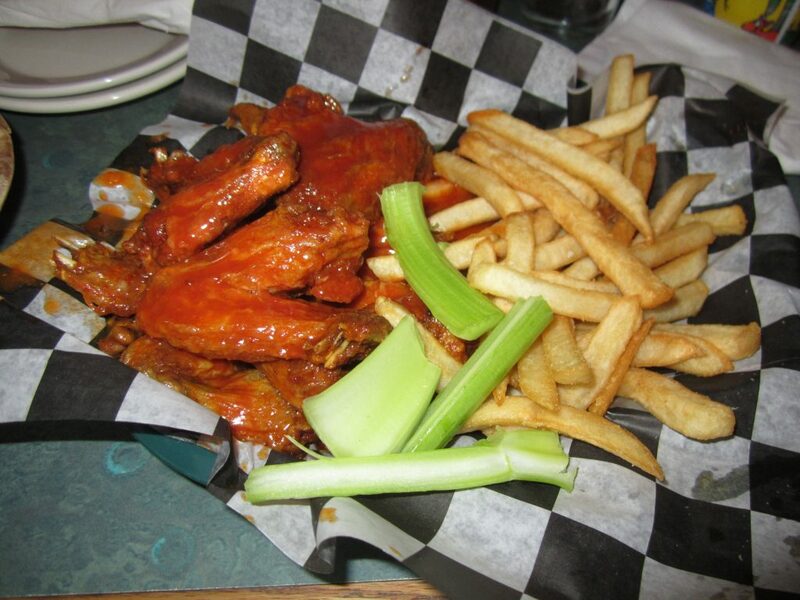 They came with celery and blue cheese as well as a side of fries, which my wings often enjoy as good company. At first, the wings seemed a nice size, but when you break them apart to see them as they are, I have to admit that they are a bit on the small side. The meat, however, had a slow roasted flavor to it and was so tender it practically fell right off the bone as I ate. Usually a wing place will rely heavily on the sauce to bring the flavor, and the chicken goes overlooked. But in this case, the flavor came from both the sauce AND the chicken making it a nice collaboration. The Spicy sauce that I ordered (which was one above the Mild) had some very nice buttery buffalo flavoring, but I wish it packed a tiny bit more punch. The Hot sauce, which I tried next, had more punch but the flavor was a little lacking and tasted more like Tabasco than a buffalo mix. If they could marry the two together, it would’ve been a perfect blend. But either way, I still had one more sauce to try so I moved on to the Smoker… which was too hot for me, but you heat seekers would have loved it. Not unlike the name, it had a smokey flavor to it and the consistency reminded me of a tangy BBQ. It almost acted like napalm as it stuck to the sides of my throat with an incredible heat that would not subside. The bottom line is that each bite of these wings kept me wanting more. And even though they weren’t the largest wings, what they lacked in size they made up with flavor. So if you crave a great wing in the South Jersey area, I highly recommend taking a trip down Rt 206 and pulling up a chair as you will not be disappointed. UPDATE: When I reviewed this bar, I was very happy with my meal and gave them a 4 1/2 rating to leave room for other wing joints to do better. But after reviewing over 50+ restaurants, I have learned that not one of them IS doing better. So, I have returned to Pic-A-Lilli a bunch of times since, and have to say that they still reign supreme in the world of the wing and continue to surprise me with results. The last time I was there, the Spicy sauce was a lot hotter than originally posted and the flavor was still super intense. This is why I have come back to update this review and give them a well deserved 5 wing rating. Come one, come all, and enjoy some of the best wings that I have ever eaten.